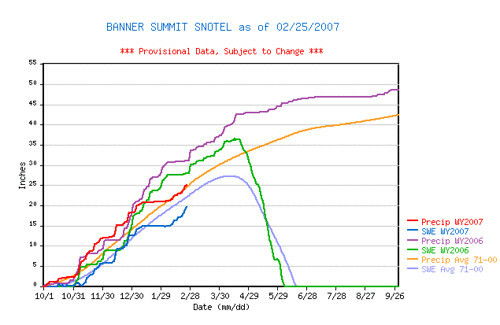 In Idaho we spend a fair amount of time talking about the snowpack. As Idaho is a mountainous state, our rivers and all of the wildlife dependent upon them, survive based on a snow melt of water from the snowpack. You might recall last year I posted about how we had an above average water year, but the snow melted off 3 weeks faster than normal. In fact, it has melted off noticeably faster over just the past 10 years. See my report on Non-Scientific Global Warming Observations. After a fairly wet early winter, January dried up with only a single day of precipitation. It was the second driest January on record. We quickly fell 20% behind the normal snowpack. Of course, the last 10 days has been non-stop wet and snowy weather. I thought I would look up just where we stand at a popular central Idaho location Banner Summit. Here is the graph from the Natural Resources Conservation Service of the USDA. There are a couple of interesting facts about this. 1) We are still 11% behind the 30 years average for snowpack (Blue line to Purple line). 2) precipitation for the water year is normal (Red line to Yellow line)(implies that we have received the right amount of precip, but it has fallen as rain and not snow.). If we stay behind normal snowpack and what we have comes off early like last year, it could be a very dry summer in the mountains (and the valleys). When any body in the whole global warming community can make any type of future forecast and have any degree of accuracy, then I might start thinking that someone really has a clue...As is there is so much that is not know. To make any kind of comment about weather patterns and infer that is due to global warming without any research is completly irreresponsbile! It becomes a cause and not science. It is damaging because it makes people dismiss everything that is said about global warming.